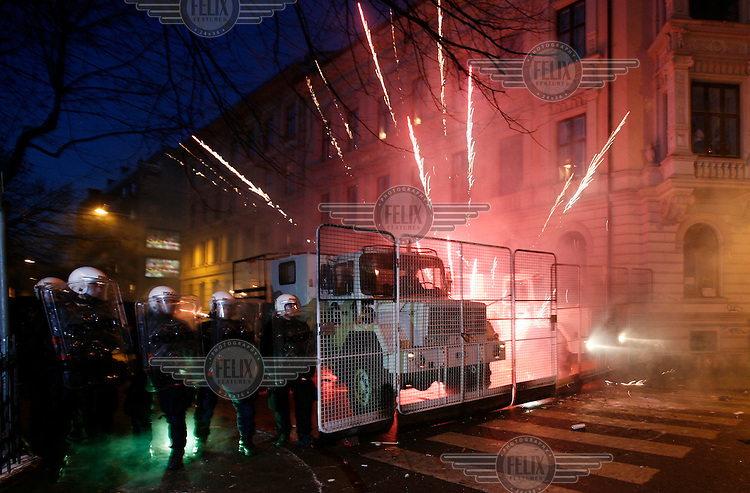 Fireworks explode between police vehicles. Pro-Palestinian protesters clashed with police as they held another demonstration against Israel in the Norwegian capital Oslo. Violent clashes lasted for hours in the centre of Oslo. Israeli forces began a series of air strikes on the Gaza Strip on the 27th of December in retaliation against Hamas rockets fired into Israel. After eight days of bombardment, leaving over 400 Palestinians and four Israelis dead, Israeli tanks launched a ground invasion on the 4th of January.